While I was trying to study, I was thinking “MAN I REALLY feel like cookies”, so I said bye to my books and HELLO kitchen ! Because my cravings were so sudden, I didn’t have time to soften my butter, but creaming it with the beater attachment of my stand mixer does the trick! I chopped up the butter into 1.5cm cubes and mix it in medium speed for around 10 minutes. During the 10 minutes, I got all the other ingredients ready. When the butter is softened, I creamed it together with the sugar, egg and vanilla. 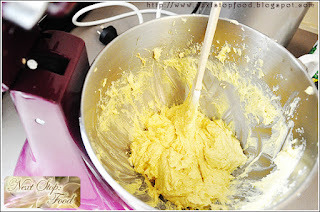 Then the dried ingredients were mix into the butter mixture. This is a rather healthy recipe (ignoring the fact that there’s actually butter inside) because it contains linseed meal which is low GI and rich in dietary fibre and there’s also almonds which is a source of many nutrients which help in development of the brain. 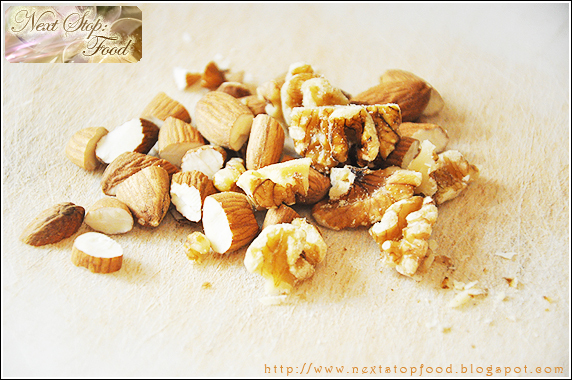 Research has proved that almond induces high intellectual level which is perfect for studying! 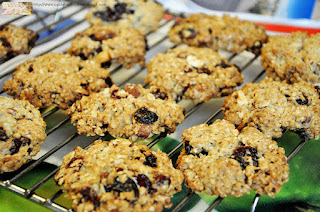 The cookies also contain oats, walnuts and cranberries which aid in preventing heart diseases and lowering/regulating cholesterol along with the linseed and almonds. 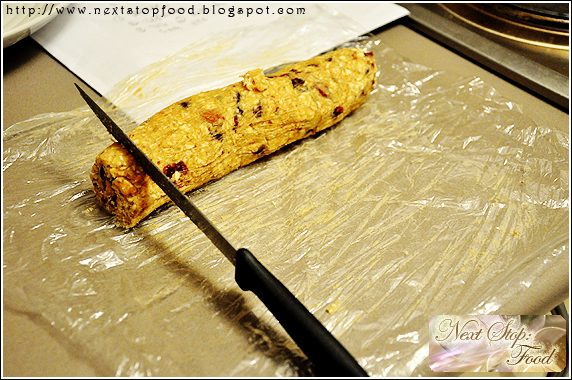 After mixing all the ingredients together, I divided the mixture and shaped it into logs. If you have time to chill them in the fridge for around 1 hour, it will be easier to cut, but if you don’t it’s ok. My cookie logs are in different shapes because there are times when I feel like a small cookie such as those guilty late at night cravings. The cookies getting ready to be baked! This scrumptious yet healthy cookie is simple to make and it keeps in an airtight container for around 1-2 weeks. Please let us know if you have suggestions for variations of the cookies! Note: I get my linseed meal from Chemist Warehouse – it’s organic and economical ($3.69 for 500g) and my nuts are from the Paddy’s Markets – they are cheaper comparing to the supermarkets. 2. In a separate bowl, whisk the flour, baking soda, cinnamon,salt and linseed meal together. 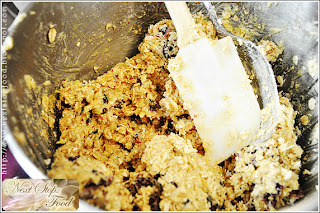 Stir this into the butter/sugar mixture. 3. 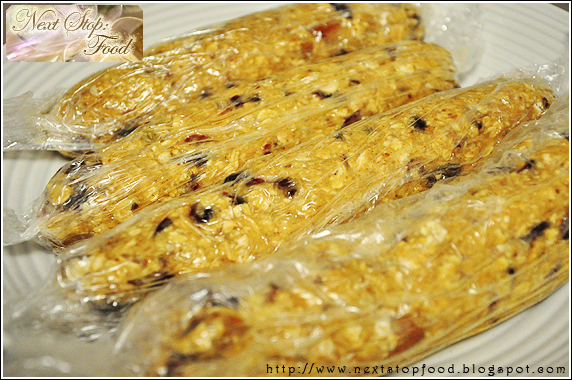 Stir in the oats, cranberries, almonds and walnuts, if using them. 4. Roll them into logs on a cling wrap and either chill the logs for around 1 hour in the fridge and then cut it or just cut and bake it straight away. 5. 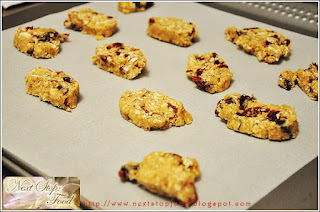 Position the cookies two inches apart on a parchment-lined baking sheet. Bake them for 10 to 12 minutes until golden at the edges but still a little undercooked-looking on top. Let them sit on the hot baking sheet for five minutes before transferring them to a rack to cool.